Optimize the success of your fair stand with the official trade fair newspaper! Frankfurt daily is the official trade fair newspaper of Messe Frankfurt with issues devoted to the Automechanika, Musikmesse, Prolight + Sound, Light+Building, ISH and IFFA. 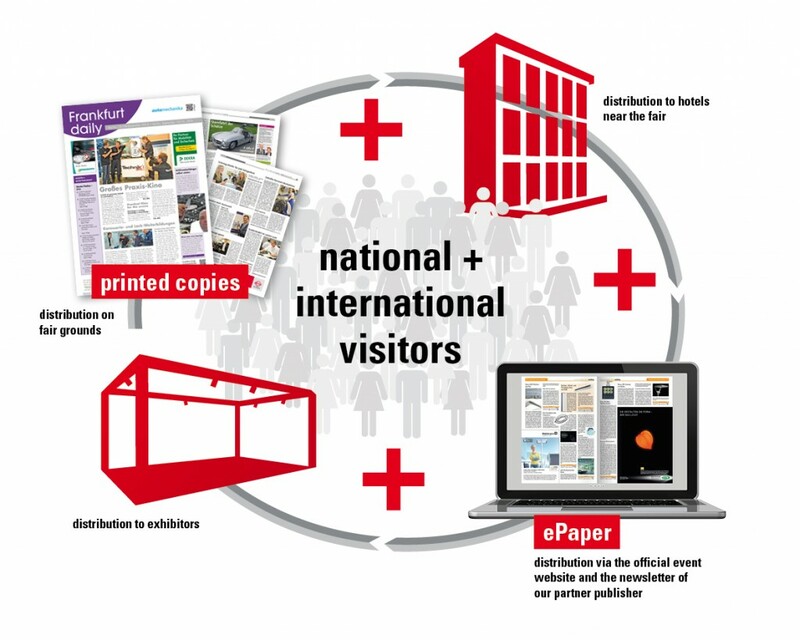 The bilingual (German/English) fair newspaper offers visitors information of relevance to the industry concerned as well as orientation on the fairgrounds. The free newspaper is handed out by hostesses to visitors every day of the fair and distributed in Frankfurt hotels. Additionally to the print version, all daily issues of Frankfurt daily are published as e-paper. It is the job of the trade fair organiser to draw visitors to the exhibition grounds. But to get them to visit their stands, exhibitors themselves must do something. For over 30 years Messe Frankfurt has been producing through its own publishing department trade fair journals to bring exhibitors and visitors together at the time of the event. These publications have proved an effective means of winning new customers and consolidating ties with existing ones. What do trade fair publications achieve compared to specialist magazines? In view of their respective orientations, it is evident that it can not be a question of ‘either… or…’ here. 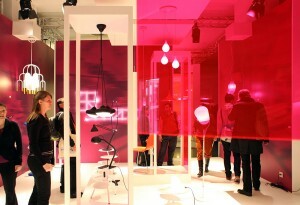 In fact, Frankfurt daily represents the ideal complement to a sound media strategy at the time of the fair. Trade journals are as indispensable for exhibitors as they are for the trade fair organiser. Exhibitors successfully use trade journals for their year-round promotional and publicity activities and as a result reach a predominantly domestic and relatively homogenous industry-based target group. Particularly in advance of the event, the organisers use the specialist media for lavish marketing initiatives in order to raise awareness of the upcoming fairs and increase the number of dealers and other buyers attending. In addition to year-round PR measures and advertisements in specialist and general magazines, direct advertising, an internet presence and online marketing, as well as outdoor advertising within and beyond the region, ensure extensive media coverage and attract considerable numbers of visitors to the scene of the fair. Obviously, the organiser can only promote the trade fair as a whole – not the stands of individual exhibitors! This is where trade fair magazines such as Frankfurt daily come in by complementing the marketing efforts of exhibitors at the precise moment and point of interest. The power of Frankfurt daily to convince and attract buyers is greatest amongst those already committed to visit the fair or, indeed, already there. Research by the AUMA (the association of the German trade fair industry) shows that 90 % of all visitors to trade fairs plan their visits very carefully. Otherwise, with exhibitions extending over up to 200,000 square metres in 11 halls, they could easily lose their bearings. The last chance to divert visitors directly to your stand is targeted marketing in the official trade fair newspaper Frankfurt daily. Find out from our rate cards about all the various ways to optimize your chances of success in Frankfurt through Frankfurt daily.